THE NIBBLE. These painless, easy switches to whole grains and other foods can give you more nutrition, more whole grain fiber and a new perspective on broadening your culinary repertoire. Why do you need to eat more whole grains? Check this out and you’ll switch even faster! Send us your favorite switches and we’ll add them to this list. Switch your breakfast cereal. 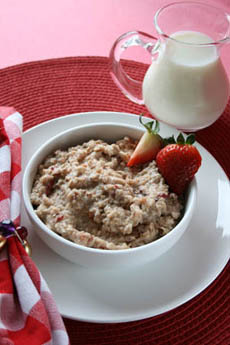 Choose a whole-grain cereal: oatmeal (see our favorite oatmeal brands), Cheerios, etc. Switch white rice for brown rice. Alas, white rice has little nutrition. The action is all in the germ and kernel, which are removed from brown rice to make it white. Why, then, does the world prefer white rice? Because long ago, Chinese emperors had their brown rice polished into white for elegance. The process made white rice much more expensive. People aspired to eat like the emperors and paid the price, to the point where only the poor, who couldn’t afford it, ate brown rice. This stigmatized brown rice, the far better food! This process also played out with wheat in ancient Rome, where the wealthy had their whole wheat flour refined into white flour and soon only the poor ate brown (whole wheat) bread. Switch out rice for barley. Select whole or hull barley (with the bran intact) rather than the prettier pearled or hull-less barley. You know why! Barley is even more nutritious than brown rice. It has even more dietary fiber and protein, and is rich in copper, iron, magnesium, manganese, phosphorus, potassium and selenium and zinc; plus vitamin B6, folate, niacin and riboflavin. Switch white potatoes for sweet potatoes. Use sweet potatoes in all of your potato recipes: baked, French fried (try baked sweet potato fries), potato salad, etc. Sweet potatoes are a nutritional powerhouse, filled with dietary fiber, complex carbohydrates, protein, vitamins A and C, iron and calcium. The Center for Science in the Public Interest gives a baked sweet potato a nutrition ranking of 184. A white baked potato: 83. Make this substitute for mashed white potatoes: mashed sweet potatoes or mashed cauliflower, the latter from the cancer-fighting cruciferous group of vegetables. Switch your pasta to whole wheat. Given how much pasta Americans eat, this is one of the easiest ways to get more whole grain into our diet. Switch your bread, bagels and crackers to whole wheat/whole grain varieties. If you can’t find whole grain crackers in your supermarket, you’ll find them at Whole Foods and other natural food markets—where you’ll also find whole grain hot dog and burger buns. Another truly simple healthy switch. Make quinoa (one of the healthiest foods in the world) twice a week: as a side, in a salad, etc. Village Harvest, a NIBBLE Top Pick Of The Week, produces whole grains—brown rice, quinoa, red rice and wild rice—that cook in the microwave in 45 seconds. Try farro (spelt), another delicious whole grain. Serve bean dip or hummus instead of mayonnaise- and sour cream-based dips. If you want a creamy dip, switch mayo and sour cream to fat-free Greek yogurt. Snack on popcorn (a whole grain), tortilla chips (whole grain) and whole wheat pretzels instead of white-flour pretzels and potato chips. Check out our favorite line of tortilla chips from Food Should Taste Good, a NIBBLE Top Pick Of The Week. Switch conventional potato chips for sweet potato chips. Look for Sweet Potato Terra Chips and Food Should Taste Good Sweet Potato Tortilla Chips. Serve corn chips (whole grain) and whole-grain pretzels or chia/salba chips (like Salba Smart) instead of potato chips. Cook more of these whole grains: amaranth, barley, black/brown/red rice, buckwheat (kasha), bulgur (cracked wheat used to make tabbouleh), corn or cornmeal (including polenta), farro (spelt), kamut (khorasan wheat), millet, oats (oatmeal, whole or rolled oats), popcorn, quinoa, rye (whole), teff, whole wheat and wild rice.It’s a snap! OH wow! What a great list of options! We love our whole grains and rarely eat any of the white stuff if we can avoid it. Our favorites are Kamut Khorasan Wheat, quinoa and wild rice with dinner and popcorn for snacks! You’ve reminded us that we haven’t had Kamut (the trademarked name for khorosan wheat) in a while. We’ve been quinoa crazy because of its amazing nutrient profile. But, change is good; think we’ll make some Kamut for lunch today! Thanks for the inspiration.